Creating an attachment with someone, even your children, is a process you always need to work on if you want to improve it. A great way to create and maintain that attachment with your child is through games and fun. So here are some games that you can use to encourage attachment. This is a great kids game because it is very interesting, quick to get playing, and fun to play. Kids enjoy it and I am pretty sure you would have fun too even as an adult as it can help you to get back into that mindset that you had when you were young yourself. For me, this game is awesome because it is very simple and you don’t need extra toys and stuff to have a great time with your kids. Also, this game is very educational and healthy for your little one. Sometimes is hard to play this game inside your home but if you can find enough places to hide behind curtains and under beds etc then playing this game at home can still be extremely fun for most of the kids. Most importantly from an attachment perspective, this game has a special effect on kids because they are hiding and someone is looking for them. It can be worth over-egging and enhancing the part when they know that the person who is looking for them cares so much because they are ready to look everywhere to find them. You have to be wondering how can swimming help in developing attachment? The most important thing to kids is for them to feel safe and through swimming, there are multiple opportunities for you to provide them with that. It is important to use small steps and build trust because kids tend to get nervous when they are in unknown situations, so if they are poor swimmers or need a little confidence building in the water – you can demonstrate safety to them, patience, and impart your knowledge, skills, and experience directly into a life-long skill for them. This game is very simple, great for little children, and you can play it everywhere and anywhere. First say to your child to look you very carefully, after that go in other room where they can’t see you and change something. It can be a different t-shirt, pants or you can put on a hat. The next step is clear, the kid has to guess what you changed. If you see that your kids can’t guess what you did, give them some sort of hint. It is good to adjust the difficulty of the game. Start with something obvious, for example, put on a jacket and after that, make smaller and smaller changes. A lot of parents have a problem with kids falling asleep. They use a lot of unconventional methods like white noise; hair dryer sound, vacuum cleaners, desk fans, or sounds on mobile apps to help them. An obvious and better solution for this problem and a solution that encourages attachment is reading some books to your kids before sleep. Most of us have tons of kid’s books with great stories and you just need to find the time or make time to tuck your kids into bed. Your kids can learn something from each story and you will get a form of authority in their eyes because you teach something new to them every night. An important way to encourage attachment with older kids is game tables. Game tables are awesome for any house because you can pick up a game at any point – the sight of them in the house can inspire impromptu matches, and they can really drive a competitiveness in your children that will stand them in good stead. Game tables like a foosball table, air hockey or billiards are great games for two people and you can spend hours playing those games without even noticing it. It is not important who wins and who loses (well, depends on your children! ), but what really matters is spending time together and have fun. Game tables like foosball table help football teams to teach how teams work, so playing foosball or air hockey helping your kids to learn more about teamwork. There are hundreds of ways to build effective attachment with your children, but the truth is, that looking through all of these examples – the most important thing is to spend time together and to bond over a common goal; be that teaching/learning, or competing. Enjoy your time, with them. 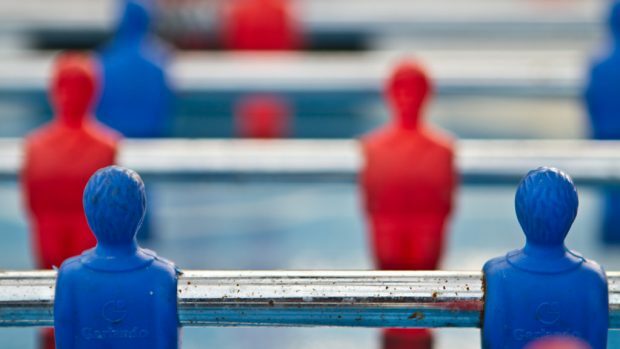 Mark is the owner of http://www.foosballzone.com/ has been playing foosball for over 25 years. Now he plays foosball with his sons every week and they bond over the game whilst having a great time.